1. Intensively smoothing gommage acid peeling. It contains fruit acids, which exfoliate the epidermis. When used before applying a mask, it smooths the skin, facilitating absorption of active ingredients. Upon contact with the skin, the gel formula of the cosmetic changes into a delicate peeling “rolling” over the skin. 2. 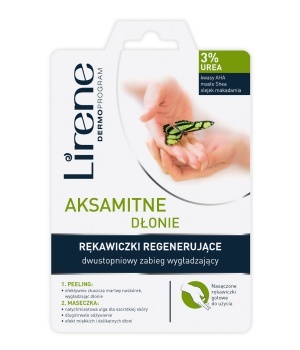 The regenerating mask in the form of impregnated gloves, thanks to its content of a rich composition of nourishing and moisturising ingredients, provides immediate relief to rough and chipped skin on the hands. - AHA acids - coming from apple and citrus fruit extracts, effectively exfoliate and regenerate the skin. - Shea butter, allantoin, macadamia oil and UREA - alleviate irritation, helping soothe microdamage caused by drying out of the epidermis and restoring softness of the skin.